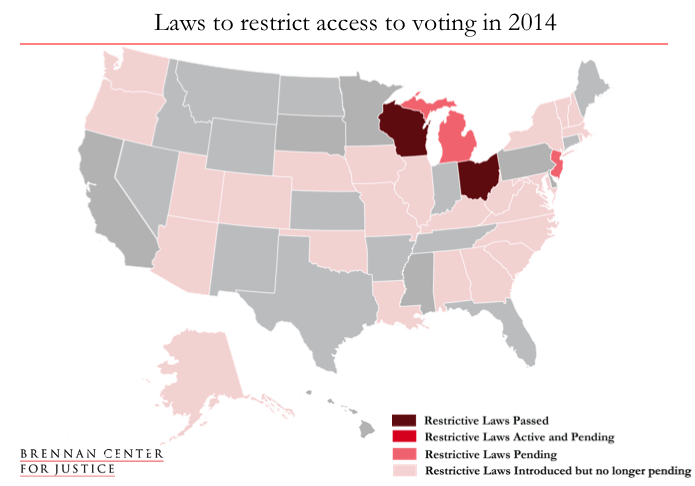 See our roundup of voting law changes since the 2010 election. 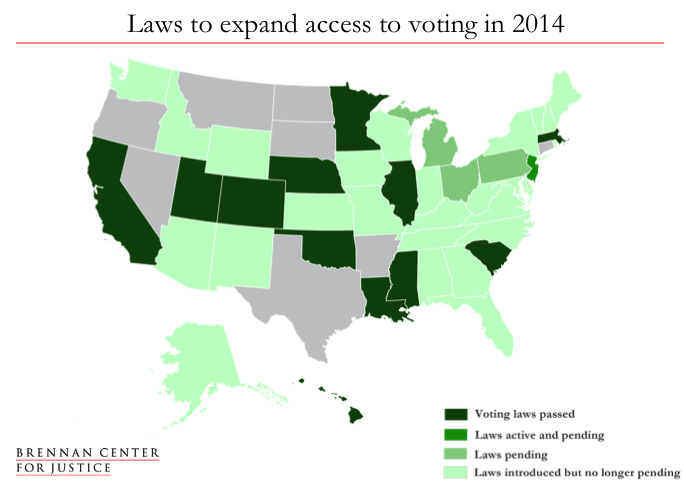 Also see our roundup of voting law changes in 2012 and 2013. A.B. 1589: Streamlines ballot requests for military voters. S.B. 1063: Provides voter registration assistance to eligible applicants in juvenile detention facilities. S.B. 113: Expands pre-registration to vote to 16-year-old citizens. S.B. 161: Expands language access for voters who speak a language other than English. H.B. 452: Prohibits distribution of false information about the time, date, place, or means of voting with the purpose of interfering with the franchise. H.B. 2590: Establishes same-day registration at absentee polling places starting in 2016, and Election-Day registration at polling places starting in 2018. H.J.R.C.A. 52 / H.J.R. 102: Places a ballot measure before voters to establish constitutional protections against discrimination in voting. Voters approved the measure in the November 2014 election. H.B. 105: Establishes pilot program to expand early voting for 2014 general election; establishes pilot program for same-day registration for 2014 general election; expands opportunities for students to vote. H.B. 501: Permits 16- and 17-year-old citizens to pre-register to vote when they apply for their driver’s license. H.B. 4072: Establishes online registration; permits 16- and 17-year-old citizens to pre-register to vote; establishes early voting starting 11 business days before the election until the second business day before the election. H.F. 2096: Establishes online registration. H.B. 624: Expands access to absentee ballots for deployed emergency response providers. L.B. 661: Establishes electronic registration at DMVs; establishes online registration. H.B. 2576: Expands access to absentee ballots for voters living on tribal lands. S.B. 825: Expands absentee voting options for military voters and their families. H.B. 156: Establishes pilot program for Election Day registration. S.B. 117: Allows registered voters without a DMV signature to update their registration information online. S.B. 135: Gives voters more time to register through certain methods. B. 20-0264: Establishes online registration. S.B. 205: Conditions any determination by the Secretary of State to mail unsolicited absentee ballot applications on legislative funding for that particular mailing. S.B. 216: Prohibits individuals who lack identification or a Social Security number from voting even with a provisional ballot. S.B. 238: Reduces early voting period and eliminates same day registration by eliminating the week during which voters could simultaneously register to vote and cast a ballot early and in person. S.B. 324: Reduces early voting period and hours. For purposes of this document, a bill has passed if it has advanced through all required stages in the legislative and executive branches, including signature by a governor if necessary. Thus, in most cases a bill that has advanced through both houses of the legislature is not counted as passed unless a governor has signed it. Certain types of legislation, such as resolutions, can advance fully through the legislative process without signature by a governor; these are counted as passed if they have cleared the legislative branch. Legislation that places a ballot measure before voters is counted as passed, even if voters have not yet approved the measure, as long as the legislation has advanced through all necessary stages of the legislative and executive process. If a ballot measure has been rejected by voters, it is no longer counted as passed. Accordingly, the controversial Missouri measure which would have allowed for six days of early voting, but would have set a constitutional limit on the legislature’s ability to provide additional early voting days is not counted as passed at this time because it was rejected by voters on November 4, 2014.